2015 Mercedes-Benz E400 Convertible. A large turbo engine in a convertible with style and class. Like its fixed-roof sibling model, the 2015 Mercedes E400 Convertible has been extensively redesigned and updated for 2014. Changes are marked by driver assistance systems updated and style changed significantly: new headlights in a single housing, new taillights, a new grill and new front and rear faciae. Unlike the 2014 E -Class sedan two-door models maintain their muscular rear haunches, an element that performs best in the larger models. 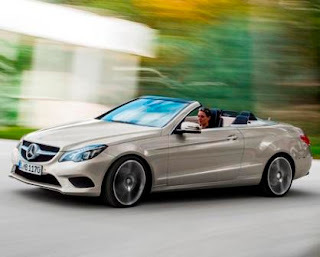 The 2015 Mercedes E400 Convertible will be the introduction of a twin engine turbo V -6. Despite its 3.0-liter displacement, the car carrying the engine will be called E400 and if you think something strange this engine is up to of producing more power than the E350. Although the numbers for the United States have not yet been presented, it is expected to produce 328 horsepower at 5,500 rpm, compared with E350 engine that produces 302 HP at 6,500 rpm. The torque difference is even more significant. Whereas the E350 produces 273 pounds -feet at 3,500 rpm, the E400 will 354 pounds -feet at 1,400 rpm. The estimated time of the 2015 Mercedes E400 Convertible from 0 to 60 mph in 5.3 seconds is fast enough, being more than a second faster than the E350 cabriolet. The speed is regulated and reaches 130 mph. Fuel consumption is rated at 31 mpg in the optimistic European cycle, in real life and EPA figures will be somewhat lower. Mercedes has improved its driver assistance programs. Standard nanny systems include ATTENTION ASSIST, which monitors the driver for signs of fatigue, and collision turning away system. Optional fee includes active cruise control can make minor steering corrections as necessary , monitor, cross-traffic alert lane keeping and Precrash systems to ready parts, in the event of an impending rear-end collision or impact pedestrians. Electrically operated, not a retractable hardtop. Thanks to its acoustic insulation thickness, this reduces wind noise. In addition, a spoiler rises from the windshield frame when the roof is open, further reducing turbulence and wind noise that would otherwise rush with him. The fabric is so difficult that is said to be almost impossible to cut through it with a knife. When retracted, the roof consumes much less space in the trunk of a folding hardtop would, leaving more room for luggage and others.